Back from a hot trip over to Austin, Texas for the solo competition. Lori, Doug, and all the volunteers did a great job and have big plans for the event next year. This year the judges were Chris Apps and Ed Krintz. This was my first competition this year and despite the fact that I am still getting over the effects of a nasty fall (down time from playing really) I’d say the results weren’t too bad. Chris Apps judged the Strathspey/Reel, Jig, and Piobaireachd events and Ed Krintz judged the 2/4 March and 6/8 March events. I was first up for each event and unfortunately didn’t settle myself down in time for the 2/4 March. I started out well and immediately realized I had begun the 4th part for the 2nd part. On the repeat I had played the right part and the tune finished well. But the damage was done for that event. I was playing "Donald MacLean's Farewell to Oban". Next up was the Piobaireachd. 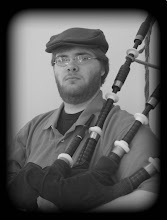 Now, this was the first time since Tulsa ’08 that I played Piobaireachd in competition. I had been working on "Alasdair Dearg" since the beginning of the year and decided to play that one. I did well, and was awarded 1st place. I decided to reintroduce “John MacColl’s Farewell to the Scottish Horse” for 6/8 competition. I think this was a tune I played back in 2008 a few times. I felt some hesitation in the 3rd part, but overall thought it went well. I was awarded 3rd place. For the Jig and Strathspey/Reel I submitted my usual tunes “The Curlew” and “The Ewe with the Crooked Horn" and "Bessie McIntyre". I felt myself speeding up in the jig just a bit, but held it together; 2nd place. Call it a moon phase, but lately I’ve been a little confused on how to present my reel and was told it was a bit choppy in parts. Since the fall, I think my strathspey and reel have suffered the most. Hopefully it’s just growing pains. Overall it went well and I was awarded 3rd place. Set-up: R.G. Hardie Henderson Pipes and ABW chanter, chanter reed unknown, MG tenors/Selbie Bass, Ross Livingstone bag. The grade 3 field was an impressive group and I look forward to meeting everyone again soon.